When I Skype her from her apartment in Williamsburg, she confides that she’s “really, really stressed out” – but not because of the album. The headache is because she’s packing up her place ready to move out and tour. When it comes to talking about Asiatisch, though, she’s all warm laughter, recounting her own experiences of alienation and rapid-fire links to things that inspired the record (among other things, Preditah, Migos, Lady And The Tramp, Tang Dynasty poet Li Bai and Eddie Murphy film The Golden Child). Fatima Al Qadiri: I’ve never been to China. So what was your first engagement with Chinese culture? Fatima Al Qadiri: I feel like my first engagement with Chinese culture was either through Looney Tunes or a Disney cartoon, one of the two. Musically, I wanna say probably (laughing) 'Chopsticks'. You know, I feel like 'Chopsticks' is like the consummate imagined Chinese piece of music. Even the title! It’s about creating this Other, or caricaturing the Other. So that’s part of my earliest childhood memories. What idea did you form of China as a child? Fatima Al Qadiri: I found from reading American magazines etcetera, the word 'Communist' was very strong. So I imagined it to be this very bleak, Socialist-enforced landscape where everybody wore the same outfit, and had a very strict regimen and schedule and way of life. One thing that had a direct influence on the record was Lady And The Tramp – 'We are Siamese, if you please' – and that was probably one of my earliest influences. China has been, through the eyes of so many different Western films and magazines and newspapers, made into a villain. It’s about being exposed to this portrait, this long-term portrait of a villain. What sparked your interest in making this album – did you become interested in the culture of China itself? Fatima Al Qadiri: I think I was enlightened a bit by this college class called Chinese Literature. Just learning a little bit about China’s literary history was really eye-opening. Even though it was in translation, even though it was taught in an American university by an American professor... I was fascinated by his method, because he really inserted you in Ancient China. It was like virtual reality poetry or something. I think that was the first (time I was) conscious of something other than the West creating. It’s not really just about this construct, it’s also about Asian motifs in Western music, that not a lot of people have articulated. That there is a prevalence of Asian motifs in rap, grime, and in other genres of Western music that is not being spoken about or discussed. Why is it there? What does it signify? Did you reach any conclusion or comment about why you think it’s there? Fatima Al Qadiri: I think for rap, and for grime, it’s inextricably linked to martial art. I feel like there is this kind of obsession with martial art by certain producers and certain rappers, because kung fu is seen as this pure practice, and is also extremely masculine. And it’s about power – I think it’s about the powerless trying to gain power by using these motifs. What’s your relationship with the genre of sinogrime? Fatima Al Qadiri: I don’t know if I would call it a genre. Maybe a subgenre or something. It wasn’t a movement, it didn’t have a club night or any of those things – it was a strain of grime that was identified, like in a laboratory, by Kode9 (laughs). It’s not a conscious thing; maybe Wu-Tang Clan were the most conscious of their use of Asian motifs. And for instance, you know Migos? They have a track called 'Chinatown'. It just shows you that this influence and this motif - it’s not a trend. It’s something that every generation is influenced by. The fact that grime itself was a very masculine genre, it made sense that Asian motifs would play a part in it. Because there’s something inherently villainous in the sound of grime, so this villainous Asian sound is appropriate. What I’ve been wondering is, in your use of these motifs and expansion on them, if you’d consider that an homage to this trend, or a deconstruction of it, or how you would frame it? Fatima Al Qadiri: All my records – I’m gonna paint them with one big brush right now – are an interpretation of an existing idea. An existing music. But it’s just my interpretation. And I think for this record, sinogrime was one element of inspiration, but it was really about using classical Chinese poetry as a basis from which to tie instrumentals together. Because to me, that represents the ancient soul of China. I feel like some experts can make a summary of what it’s like there (now), but I’m not one of those people. I wouldn’t want to make any sweeping statements about China, because China is massive – and I’ve never been there. I’m creating something based on a Western construct. I’m using a reality created by a non-native source. Given what a massive subject it is you’re drawing from, how did you begin that process, and how did you narrow it down to the cross-section of references that you’ve got in there? Fatima Al Qadiri: How I started the record is a very basic story. A friend of mine – these artists, Shanzai Biennial – sent me an acapella by Helen Feng of a nonsense version of 'Nothing Compares 2 U' that they found on Youtube, and they gave her to re-record. They wanted a cheap Chinese instrumental, so they thought I was their woman! But I instead made something that they considered to be too sophisticated for their purposes. That’s what really started the ball rolling. And then I magically found these poems online... it happened very quickly. I recorded almost the entire album in one month. I was really inspired by the idea of using Asian motifs. I didn’t even have time to think about it really deeply until it was done. And the poetry that you used, was that poetry that you studied back in college? Fatima Al Qadiri: No, it wasn’t the poetry that I studied, but one of the poets I did study. Li Bai was a famous Tang dynasty poet, and his poem is called Jade Stairs Resentment, so that’s what “Jade Stairs” is named after. Each of the tracks, under the umbrella of the overarching concept, have their own aspect or idea of Chinese culture or sinogrime that they focus on. Did you come up with a concept to focus on before making each track, or did you think about it afterwards? Fatima Al Qadiri: I didn’t even know the term 'sinogrime' until after the record was finished. 'Sinogrime' as a word didn’t exist to me while I was making the record. But one of my favourite grime tracks is Preditah’s 'The Big Wok' - it came out on the Solitaire EP in 2011. I think that was the most influential track leading up to this record. After the record was finished, my best friend, who’s in Future Brown, J-Cush, sent me this Kode9 mix called 'Sino Grime Mix'. And I was like, 'oh, that’s what it’s called.' I had never heard that word before. To take 'Wudang' for example, it’s a very martial arts sounding track; I’m wondering if you sat down and thought 'I’m going to make a track that’s an homage to Wu-Tang Clan and the Wudang region,' or whether you made the track and then thought the sound fitted that idea. 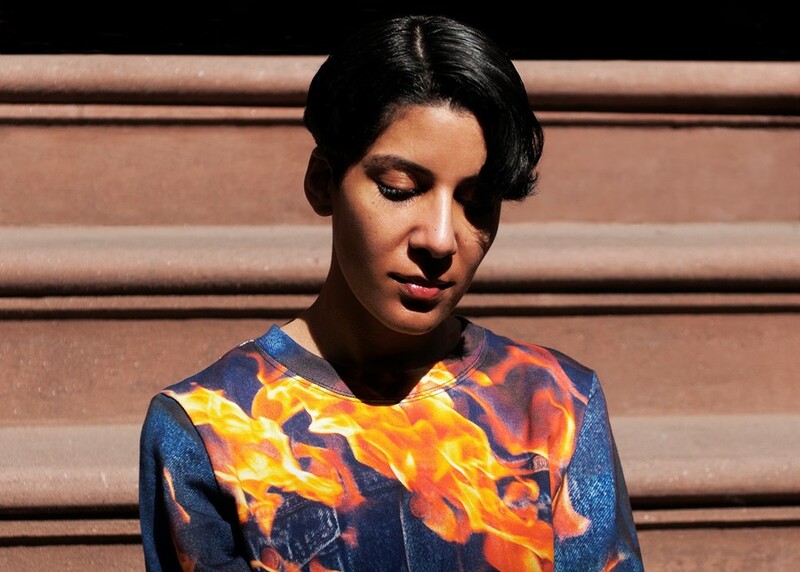 Fatima Al Qadiri: I’m not gonna lie, I always make tracks and then the idea happens. The piece of music happens first. I don’t like to think – I’m not that kind of person, I don’t think 'this track is going to sound this way' – I improvise, and then it becomes a track. I don’t like to pre-empt anything while writing music. Except with basic ideas like 'this is going to be an Asian motif track,' which is not very narrow. Why did you choose the German word for 'Asian' specifically as the title? Fatima Al Qadiri: Because I feel like German is the language of high philosophy in Western languages. It’s also alien for me, because I don’t speak German, so it’s taking this idea of an imagined China created by the West – who are aliens – who are treating China like they’re aliens. So it’s all about alienation. I’m drawing attention to this notion of 'what is Asian? Why does this word function the way it does?' 'Asiatisch' makes it even more rarified and more alien and more removed. I wanted something that would be alien to English speakers, so German was perfect! It’s a record about – not just alienation, but about painting a portrait of an alien culture, whilst demonising that culture. But also bizarrely how that’s translated into music, the most abstract language. Do you have any plans to go to China now? Fatima Al Qadiri: Hopefully. Maybe. But I can’t predict the future.